Coral Cay was first introduced to me by a few friends who were studying Marine Biology at university. Several of them were heading out to take part in projects in the Phillipines and at the time I was working in a UK dive store. I was helping to sell kit to divers on their way out to the site, and so even back then, the project was of great interest to me and I was delighted when the opportunity arose to visit. Coral Cay has been operating in the Philippines since 1995 but only from their current location in southern Leyte since 2002. 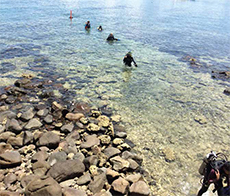 The project works closely with the Fillipino Reef and Rainforest Conservation Foundation Inc, and the local government, to monitor and survey the sites environment.